I am super excited about this review. At last, I found a pair of trousers that fit well for my body type. I mentioned several times on this blog, my goal is to add more pants to my closet. I tried on this pair in a size 00 short last week and it was an epic fail. The length was extremely long on me. They were snug in the thigh area but way too big in the waist. I had high hopes for them but they definitely did not work out for me. Since the one from LOFT fits me really well, I thought why not give it another shot? After trying on several styles/sizes, I walked out the store with the Marisa bootcut in a size 00 regular. These boot-cut pants run relatively small. I originally tried on a size size 00P. While the fit was great overall, the length was a tad short on me (for reference, I am 5'2"). I decided to try on a 00 in the regular length. I like my pants almost touching the floor. There wasn't much difference in terms of the waist measurement (probably 0.5 inch). However, there certainly was a huge difference in length. 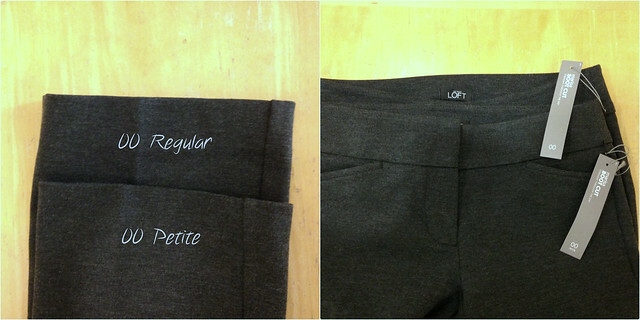 The regular version of these trousers has a 33" inseam vs. the petite version has a 29" inseam - see the last photo. I am probably right in between. Although the regular length is a bit long for me right now, I am hoping after a wash, the length would work out. If not, it's still an easy fix. The waist measures 12.5 inches (laying flat). I have no issues with a gap in the waist whatsoever. They fit really well without being too tight. These pants made out of thick ponte knit material which I absolutely love. They feel great on skin and are super comfortable. They gave me a nice silhouette but weren't skin tight. They hug me in all the right places and overall, are very flattering on. They are just simple the perfect pair of pants that I can just throw on and wear every day to work. LOFT has frequent sales and discounts that make these pants very affordable. I wish more colors were available. I will definitely go back and get the black one as well. Overall, I can't say enough good things about these pants. I hope you find this post helpful. i really like the shape and fit on you! i need some more pairs of trusty dress pants to get me through the winter, so i'll be scoping this out - thanks for sharing your find! It does really hug you on the right places. I find that Loft pants are bigger on me compared to AT. Alteration expense is not fun. You look amazing ! A bootcut will always be my fave.....it elongates any pair of legs & the Marisa you're wearing is no exception! this review was really helpful. I'm always on a hunt for nice fitted trousers! These pants look pretty fantastic on you. Thanks for the great review! I ALWAYS have a problem with a waist gap in pants. I've never tried on pants made with the ponte knit material before, but your praises make me want to check these out. :) Do they almost feel like you're wearing fitted sweats? Because that would be amazing! Thanks for the review - these ponte pants look really comfy! I like the fit of Marisa too! Hi, I am new here! I just want you to know you are amazing chic in those photos! !